It’s a heartbreaking truth that many senior animals who end up in animal shelters are often overlooked by potential new owners. The reality is that most people looking for a new four-legged friend, often pass over older dogs who may need more care and attention than the fitter, younger ones. However, one guy is making it his mission to seek out those grey-faced animals to give them the twilight years they deserve – and we can all enjoy it via his Instagram. 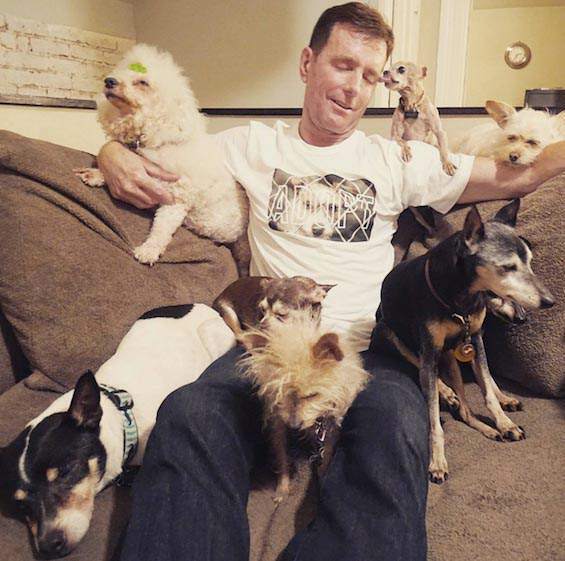 Steve Greig is the guy providing a home to the otherwise unwanted animals and his passion for adopting elderly dogs started when one of his most beloved pets died, reports The Chive. Steve went to a local shelter and found the least adoptable dog. After that, one adoption quickly turned into many. Now he has a total of ten dogs in his care, as well as a pig named Bikini, two ducks, some pigeons, a rabbit, a mouse-fighting gang of kitties, and a few chickens. His passion for animals began as a kid – his parents let him take on as many pets as he could handle – and the love has never left him. I bet that’s an amazing house to live in – dog or human.